(1) A bowl has a small hole at the centre of its bottom. 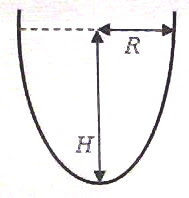 Water poured into the bowl drains through the hole and the height of water column at any instant t is H. The radius of the free surface of water is R (fig.) at the instant t. If the time rate of decrease of the height of water column is constant, how is H related to R? dH/dt = constant, as given in the question. 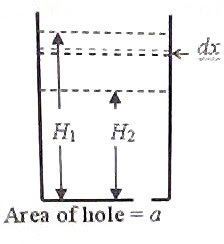 Since the velocity of the water flowing out (velocity of efflux) through the hole is √(2gH), the rate of flow is av = a√(2gH) where a is the area of the hole. Since a, g, π and dH/dt are costants, H α R4 [Option (e)]. (2) A jar of uniform area of cross section A has a hole of area a at its bottom. If there is water column of height H1 in the jar initially, what time is required for the height to become H2? v =√(2gx) where x is the height of water column. [The negative sign shows that x decreases]. Integrating between the limits x = H1 and x = H2 we obtain the required time t.
(3) A sphere of wax (density 900 kgm–3) has a volume of 20 cm3. Iron nails are pierced into it so that it just gets submerged in water. If the volume of the iron nails is negligible compared to the volume of the sphere of wax, what is the mass of the iron nails in the sphere? Since the sphere of wax containing the iron nails gets just submerged in water, the mean density of the sphere must be equal to the density of water (1000 kgm–3). Mass of wax in the sphere is 20×10–6×900 kg. This gives m = 2×10–3 kg = 0.002 kg. 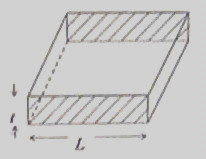 We have R = ρL/A where A is the cross section area which is equal to L t.
Therefore, R = ρL/Lt = ρ/t, which is independent of L [Option (C)]. P = V2/R where V is the voltage applied across the resistance. 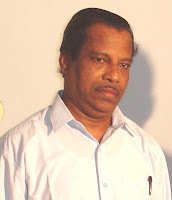 To verify Ohm’s law, the current through RT is to be measured by connecting an ammeter in series with it and the voltage across RT is to be measured by connecting a voltmeter in parallel with it. One galvanometer is to be converted into an ammeter by connecting the small resistance R2 across it. The other galvanometer is to be converted into a voltmeter by connecting the high resistance R1 in series with it. So the correct circuit to carry out the experiment is the one shown in option (C). You will find some multiple choice questions (with solution) on direct current circuits here. The phenomenon of resonance in alternating current circuits is an interesting one with many practical applications and questions involving resonance are often seen in entrance question papers. You may try searching for ‘resonance’ on this blog (making use of the search box provided on this page) to access all previous posts related to resonance. An alternating current source of negligible impedance has an emf 6 volt. It is connected in series with a series LCR circuit consisting of a 72 Ω resistor and an inductor-capacitor combination. The inductor offers a reactance of 120 Ω at the operating frequency and the power dissipated in the LCR circuit is 0.5 W. What is the reactance offered by the capacitor? It is always a good idea to check whether the circuit is at resonance (Question setters have a craze to set questions involving resonance). V2/72 = 0.5 where V is the voltage across the resistor. We obtain V2 = 36 from which V = 6 volt. The circuit is indeed at resonance since the entire supply voltage appears across the resistance. At resonance the inductive reactance is equal to the capacitive reactance and hence the correct option is 120 Ω. This question appeared in AIEEE 2010 question paper. The phase lag of current produced by the inductance is equal in value to the phase lead of current produced by the capacitor. This means that in the LCR circuit connected to the 220 V, 50 Hz supply, there is no phase difference between the supply voltage and the current and the circuit behaves as a pure resistor. Indeed the circuit is at resonance and the entire supply voltage appears across the resistor. P = V2/R = 2202/200 = 242 W.